I’m going to let you in on a secret other entrepreneurs don’t want you to know. It’s that most entrepreneurs fail to get what they wanted when they started their businesses. But people who’ve been in business for themselves for 5 years, 10 years, 15 years rarely report ever HAVING the freedom and control over their time that they want, the level of wealth they dreamed of to make their future secure, or the impact on the world that they wanted. Instead even many of the entrepreneurs in the top 1% report being a slave to their business, making just enough money to get by – with only a little left over but not generating any meaningful wealth, and having that sinking feeling that they could and should be making a much bigger impact. That’s because they haven’t created a SCALABLE business. If your business isn’t scalable you just have a job – only worse because it’s a job you can’t really quit and your boss (that’s you) doesn’t give you any time off. Like you, I believe that the best investment you can make is in yourself, bar none. And the best investment vehicle for doing that is an entrepreneurial venture. The internet has all but completely democratized wealth and opportunity in the developed world and leveled the playing field for any literate person. Never before in history can one person have such an immediate and profound impact on millions of people – by utilizing technology platforms and cultural preferences designed to seek out and find the most influential thoughts, ideas, and solutions. YouTube makes celebrity available to anyone for free – Google gives any product prime ‘shelf space’ for free – WordPress any person a publisher or news source for free – Twitter gives any author, speaker, or thought leader a nearly infinite platform for free – not to mention the opportunities presented by Facebook, LinkedIn, Stumbleupon, Digg and hundreds of others. Best of all, underlying technologies like Mysql, Apache, pHP, and Ruby on Rails, make it possible for anyone with determination and an internet connection to make the next context-destroying platform. The only requirement to break into the elite club of the super-rich is having the right idea at the right time and the commitment to see it through. Given the cultural barriers to success just 100 years ago – or even 10 years ago, this is just astounding. But we’re not as familiar with the cold fact that most entrepreneurs – even the outwardly successful ones – rarely create any wealth to speak of. Why are you dodging the wealth bullet? Thanks in part to books like Tim Ferris’ “4 Hour Work Week“ and Robert Kiyosaki’s “Rich Dad, Poor Dad” most of us now understand that as long as we are trading our time for money, we cannot be wealthy or financially free. The fact is, regardless of your business model, unless you are actually building your business to scale you are just signing up to work in a lifestyle business until you can’t any more and then rely on the kindness of your family or the foresight of your government to bail you out. 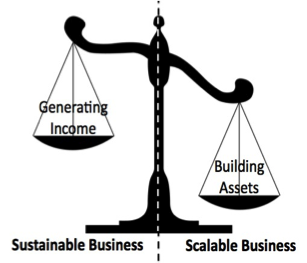 Many successful entrepreneurs prove a certain degree of mastery over the income/expense side of the financial universe – but how do you transfer value to the asset side so that business can actually scale? My partner, Bryan Franklin and I have broken it down into a sequence of steps that, when followed, actually lead you towards that brass ring where you have more profit, enough cash in your savings account to retire on, and are creating immense value in the world. Over the coming weeks, I’m going to share these steps with you, from start-up to 7 or 8-figure business. Or, you can learn them right now (and the exact steps that your unique business needs to take next) by going to Mind Money Meaning and get immediate access to exclusive free content from the most advanced entrepreneurial education system available.